For a chance to win a weekend adventure of your own, enter your email address below and discover all that St. Louis has to offer. Yes, periodically send me the latest news and special offers from St. Louis. If you couldn't tell, the Kidnapped Chicagoan ended up in St. Louis. It didn't take long before he was having a good time, either. Turns out there's a lot to do in the Gateway City. 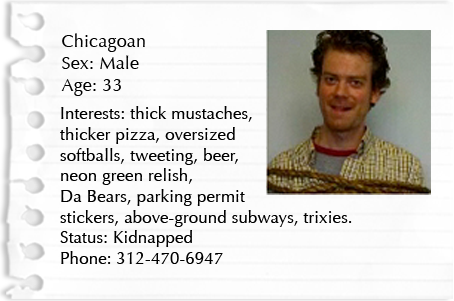 Enter your email address to stay updated on the Kidnapped Chicagoan and what's new in St. Louis. The Kidnapped Chicagoan had a great time. You will, too. Click here to plan your next trip to St. Louis. Soon after getting here, I realized there's a lot going on. Check out my Pinterest for the people, places and things I'm checking out or planning to. Looking to get in touch? I could use the help. You know, with the whole "figuring out where I'm at" thing. Gimme a shout (or a tweet).